This is the problem I'm stumbling upon a lot recently. 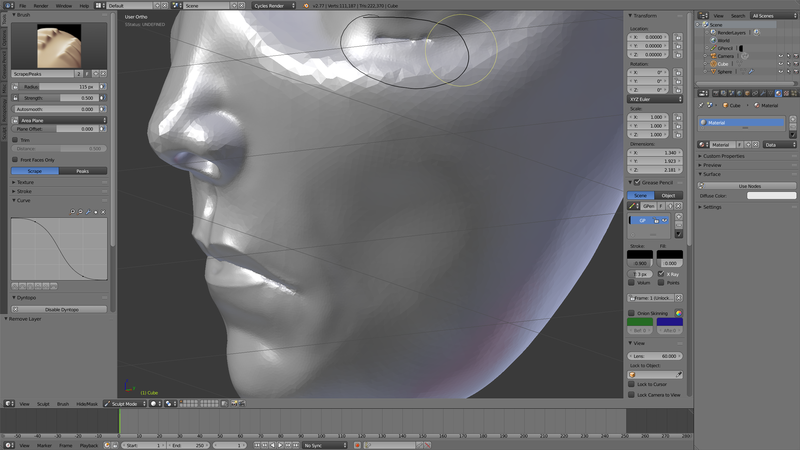 You start sculpting on perfectly flat surface, then you make some creases, maybe deeper creases, or maybe you are building geometry with inflate brush inside a hole like eye socket, but eventually this happens - you have a crease in your geometry that is so deep that no amount of smoothing or scraping is going to get rid of. 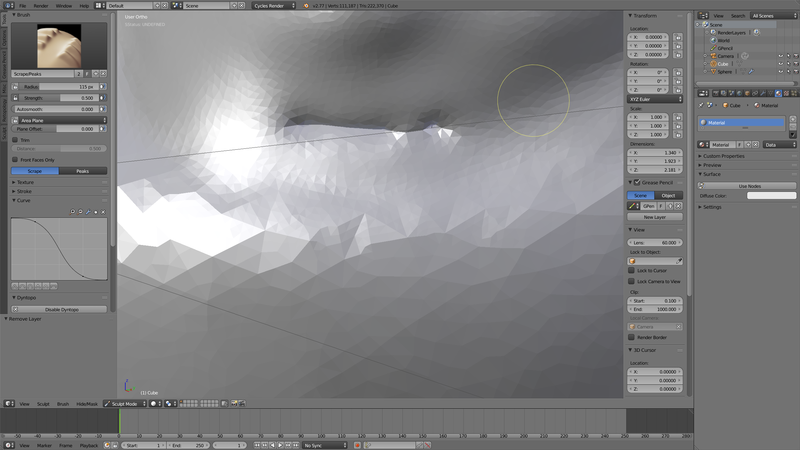 Actually when you look at it in edit mode it looks like a bubble of geometry that is stuck under the "skin" of your model. The only way to repair this place is to switch to edit mode and then just remove offending geometry vertex by vertex, then close the hole with some polygons or even one big n-gon and then you can sculpt in this area again. My question is - is it possible to flatten or smooth (repair) such area quickly, with sculpting tools, without going out of sculpt mode? You should be able to fix this with the smooth brush. Just go over the required area and it should get rid of the bubble. Just be careful to not set the strength of the smooth tool too high. Otherwise the flatten brush will help to. To stop this from happening in future you can use the mask brush to paint the area you don't want to affect. Using Dyntopo can get very messy if not done with caution, looks like the mesh is highly subdivided at this area, smoothing it will help little, since the distance in between vertices is too small, and there are lots of them, in this case I would use "Subdivide Collapse" in Dyntopo, set the details to a level to give similar resolution as the area surrounding the problematic area, then slightly touch it with a sculpting brush "other than Grab and Smooth" usually Clay brush will do fine, this will decrease the mesh resolution significantly, then use the Smooth brush, and this area will be corrected easily. Consider enabling wire view in order to see the density of your mesh while working with Dyntopo, and since I mentioned Grab brush earlier, for some weird reason, Grab brush never worked for me while Dyntopo is enabled, I don't know if this is a bug or that's the way it should be, just keep this in mind when using Dyntopo. Since you're using Dyntopo, I believe you already know that Dyntopo details level is related to the view, I believe it's in pixels, and relevant to your screen size, this is why zooming in or out while sculpting, will give different resolution results, it's always a good practice to keep the same approximate distance from your object while using it, otherwise you need to adjust the details level after zooming in and out. How to get sculpting to stop mirroring? A Fold-like Brush in Sculpting? 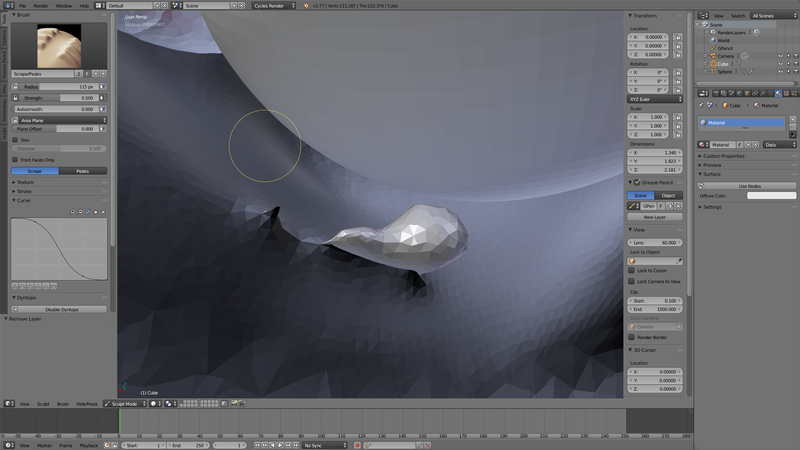 Can I create deep divots in my mesh using sculpt brush? Is there a better way without booleans?